Water usually comes into a basement due to hydrostatic pressure — the force from water building up outside the foundation. Increasing pressure makes it more likely that water will enter your home. 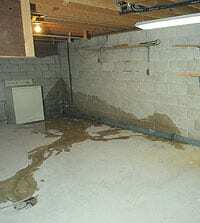 BDB has found three main types of leaks in basements we inspect and repair. Through the walls: Water seeps in through wall cracks. A cracked foundation will continue to deteriorate, and this seepage will get worse over time. Water can also seep in through tie rod ends, honeycombed concrete, and pipe penetrations. Through the floor or floor/wall joint: Most modern homes are built with an exterior drain tile system around the footing to keep water from creating pressure against the floor or cove area (the jointed where the floor and the walls meet). These systems drain into the sump pump or the city storm sewer system. If seepage occurs in this area, we first check to make sure the sump pump is operating correctly. If it is, there may be a problem with the drain tile system. Over the top of the wall: Water coming in over the top of the wall, between the concrete and wooden sill plate, is a serious issue. This usually happens when homeowners, in their efforts to keep water away from the foundation, build the dirt level higher than the concrete wall. This creates an opportunity for water to seep in through the below-grade brick or siding. It’s important to locate exactly where water is coming into the home before selecting a basement waterproofing solution. BDB Waterproofing’s qualified design professionals will inspect your property to determine the source of the leak, then prepare a proposal for repair. Call us today at 402-779-3165 or send us an email to request a free estimate.